Connections with Brighton and Hove : Tony Trafford was one of Britain's leading kidney specialists who ended up as Health Minister. He was in charge of the kidney unit at the Royal Sussex County Hospital in Brighton, making great advances in treatment. Between 1970 and 1974, he was Tory MP for The Wrekin in Shropshire and he formed a friendship with Margaret Thatcher, then an up and coming minister. He was knighted for the medical work he carried out after the 1984 bombing of the Grand Hotel in Brighton during the Tory Party conference which killed five people and injured many more. Trafford was made a life peer in 1987 and he was invited by Mrs Thatcher, by then Premier, to be health minister in the House of Lords. Within seven weeks he had seen more than 100 medical leaders to listen to their concerns about radical reforms being planned for the National Health Service. But Lord Trafford, always a heavy smoker, contracted lung cancer and died at the early age of 57. Hard working and able, he did not suffer fools gladly but was widely admired for his expertise. There is a renal ward named after him at the hospital. 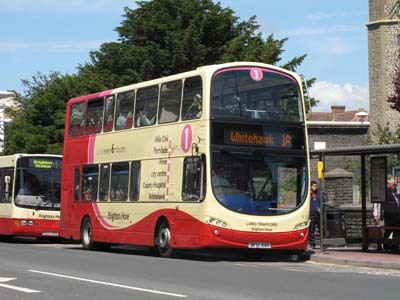 438 Volvo Gemini - carried name since delivery March 2012 on Route 1. 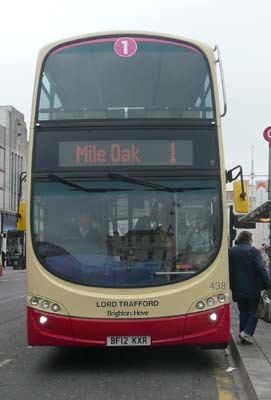 Bus repainted in October 2016 and name removed.